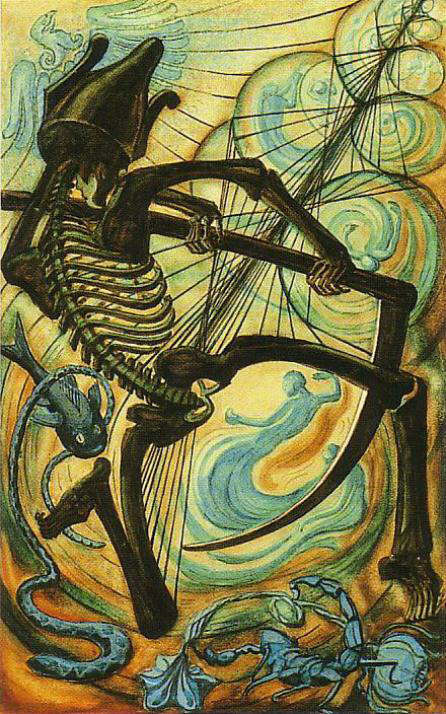 The frightening image of a Grim Reaper belies the less sinister interpretation of this card which is that of rebirth and transformation. Look for symbols of reincarnation and afterlife such as ships sailing, eggs, a white rose, the phoenix, or a sun rising. This card is the logical result of the ritual of the Hanged Man in the previous card. Death is not the final end but a new beginning. This cards represents the passing of the old, the natural end of a situation, and the dawn of a new opportunity. Below you can view the various artistic interpretations of the Death card. Death is the fear of change. The fear of losing the body. Fear of growing old. Ego fear. Confronting death forces you to cherish the gift of life. To resist change is to resist expansion of consciousness. Everything must expand and change. Everything goes through cycles of death and re-birth. The great vulture symbolizes death. The graveyards and tombstones are reminders of death. Snakes, rats, skulls & crossbones symbolize revulsion towards death. Ignorance about death brings fear and resistance. Fear of the unknowable future. Every moment dies and is replaced by the next moment. When you climb a ladder you must leave one rung behind to reach another. You can�t move on until something changes. And yet, death is the ultimate illusion. There is no true death. It is the ego that fears its own death. The essential self is in unity with everything and is not aware of time. The apple blossom and the sunrise represent rebirth. You must look towards it with optimism, or live a living death. What changes are you afraid of?